With each new year, so many of us make resolutions to better ourselves or our world as we continue on our journey through life. I have actually never had a New Years Resolution, but a couple months ago I decided that this was the year I will start. I decided to do a weekly post on something that my friends know I have been so passionate about for over a decade now: the fight against the heroin crisis. It has only recently begun to make headlines, but heroin has been killing people I care about since 1998 when it claimed the life of a special friend of mine. Heroin snuck it’s evil ways into the lives of many of my friends over the next several years, killing 13 of them by the time 2006 came around (the year Jon & I cut ties with old friends, and made new ones when we started our life together). THIRTEEN. These weren’t “junkies” to me. They weren’t dirty low-lifes. These were my friends. Thirteen people that I once laughed with. Hung out with by the fire pit telling life stories. Cried with when family members or friends died. Danced with at concerts. Traveled with on spontaneous road trips to numerous destinations. Watched horror movies with in our living rooms while scaring each other during bathroom breaks. Talked with about the world’s problems and suggesting solutions we would love to see fulfilled in our lifetime. Only their lifetime was cut short. For a very long time I was one of the people that criticized heroin addicts for making the stupid decision to do it in the first place. But after witnessing so many of these wonderful people transition from having so much potential in the world to just lying there in a coffin while I hugged their moms at their funerals, my views started to change. Most of these people were such a far cry from what society tells us is an “addict”. Kind people, smart people, loving people, strong people, selfless people, funny-as-heck people… I was fortunate enough to be involved in many different circles of people in my life, and this crossed over into many of those circles and all different types of people. Many of them held down decent jobs and usually made good decisions in life. When their addiction took over, they lost total control of their choices. And almost all of them regretted their decision toward the end and desperately wanted out. I have witnessed people beg for help to stop, and then when having a safe place for them to detox, I watched in horror as they so painfully go through withdrawals that would scare the bejeezus out of any one of those tough guys out there. I started to understand that while they were certainly at fault for trying the drug in the first place, they were most certainly not at fault for not being able to stop. I have made phone calls to rehab facilities for some of them only to be told that they require thousands of dollars for an inpatient program just to start, or that there was a 3-6 month waiting list (and this was 10 years ago… it’s more expensive and the waiting lists are longer now). I know many people who still think that addiction is a choice and if they really wanted to stop they could, but science is now beginning to prove how the makeup of our brain actually does have something to do with why some people are so prone to becoming a slave to their addiction (whether it be drugs, alcohol, food, gambling, etc.). I’m a total brain geek, and I have read so many interesting research studies about the brain as it relates to addiction. It is so fascinating, and if I had a second chance at life, I’d be working in a research lab somewhere. I am very hopeful that science will continue to find ways to help people struggling with addiction. But, we are still so far behind the times here on the home front. West Virginia has the highest rate of overdose deaths in the country. Isn’t that insane?!? Instead of being known for it’s overwhelming beauty, this great state is starting to become known for skyrocketing overdoses due to the opioid epidemic. Sad… We are better than this. One reason for this sad statistic is the fact that we are severely lacking in treatment facilities. Berkeley County finally started working on fixing that problem by purchasing a building that would house a state-of-the-art rehab facility that would be the first of it’s kind in this area. AWESOME, right? Well, not so much. Unfortunately, there are people (good people, mind you) who live and work near this building who hold the belief that an addict is just a “junkie”. Someone who deserves what they got, because they knew what they were getting into in the first place. Even though we all make stupid decisions that we know will probably shorten our life (excess sugar: diabetes; fatty foods:heart disease; smoking: lung cancer; speeding: car fatalities; tanning: skin cancer; drinking: liver damage… you get the point). They don’t want a rehab facility near their business or their home, because they fear what it would do to property values if there were a bunch of “addicts” living nearby. I hear what they are saying. The only problem with this thinking, is that nowhere in this entire nation can you find a community that had property values drop due to a successful rehab opening it’s doors nearby. On the contrary, most communities embrace the centers as having a positive impact on their society. The council sponsored a trip to other rehabs in the DC area so that these opponents could ask questions and learn about what these centers do, but the only people that went were the people that are already on board with the plan (check out the story here). One of these rehabs is right across the street from high end hotels, luxury apartment buildings and nice restaurants. The other was adjacent to a golf course. And most of us in the area know that Edge Hill in Winchester is just a few blocks from the Old Town Mall and there are no issues that the community has with them. So the mentality that the rehabs would reduce the value of our downtown area is antiquated and has been proved wrong again and again. What I find most disturbing about the mentality of not wanting “addicts” nearby, is that this location already has constant traffic from drug addicts anyway. I have witnessed people high as a kite right on King Street, seen people throwing up on Martin Street and as much as I love our downtown area, I can’t argue with clients when they say they would rather not meet downtown because they don’t feel safe there. I can also tell you from past experience that if an addict doesn’t want help, he or she is most definitely not going to be hanging around a rehab center. Nope. But, the opponents still hold the stereotype of the “low-life addict” who has nothing to give to society. I personally know some of the opponents, and I know they are decent human beings with good hearts. I believe they are misguided in their opinions because of the stigma that surrounds addiction, and the lack of transparency from those who have struggled with addiction. The stigma is real, and it’s damaging our progress in this fight against the heroin epidemic. Every day we have to fight, is another human potentially gone, a family destroyed, dreams lost. Let’s move past this so we can progress as a community. So that’s what I hope to address in this project. Recovering addicts are some of the strongest people I know, and I want to show you who they are. Each week I will showcase a portrait of a recovering addict on my Instagram account along with a short version of their story. Some of them are new in their recovery, while others have been clean for years. What they all share is a passion for life. Occasionally, I will do a recap of previous weeks here so those of you not on Instagram can follow along. If you are a recovering addict who would like to share your story, please reach out to me here. If you would like to help in this effort in other ways, please share this project and contact me for other ways you can help. I hope you’ll follow along in my journey over the next 52 weeks as I introduce you to “52 Addicts”. 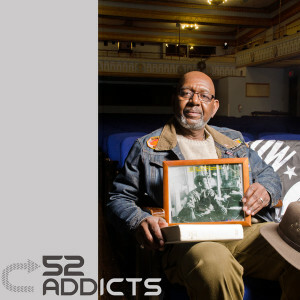 Click on image above to go to our Instagram page to see our first portrait of Vietnam Veteran, James. This is so needed around here. Kudos for doing this! This is an amazing idea and I would love to be apart of it and help carry the message. Herion has taken the lives of many people I know either dead or in and out of jails and prisons. I used to be ashamed to tell people I’m and addict recovering everyday from drug use, including Herion, but today I am grateful that I’m still here to be an example to other drug addicts who struggle. I’ve been saying for the past year how I would love to become an advocate for drug addicts and help them get treatment over jail.. Addiction is a mental health issue and it needs all the support it can get. Please let me know if I can help. I’m just seeing this, Tina! I’ll be in touch asap to set up a time! Read about you and your work in The New Yorker. Bravo! Inspiring and so worthwhile. I am in recovery for many years and feel blessed I was in the right place at the right time to “receive” help be open enough to accept it. Your photographs are beautiful! thank you.